Myrtle Francis Boultinghouse, age 89, of El Dorado Springs, Missouri, passed away on Tuesday, December 10, 2013. She was born March 7, 1924 in Guymon, Oklahoma. Myrtle’s parents were Charles and Minnie Hamby of which 10 children were born. Myrtle grew up in the panhandle of Oklahoma, experiencing the Dust Bowl and the Great Depression. Her family moved from Oklahoma to Montevallo, Missouri, when she was 13 years old. Myrtle graduated from El Dorado Springs High School in 1942 and later attended Southwest Baptist College in Bolivar, Missouri. Myrtle and Royston Boultinghouse were united in marriage on May 24, 1945 in Ft. Scott, Kansas. To this union were born five sons: Earl, Charles, Roy Lee, Don and Alan. Myrtle was saved at Glade Springs Missionary Baptist Church at a meeting with Brother Ed Elliott preaching. Myrtle later was baptized and became a member of the church. She moved her membership to Pleasant Ridge Missionary Baptist Church at a later date. Myrtle was a devoted wife, loving mother, grandmother, great grandmother and great great grandmother. One of her favorite pastimes was to write information in her daily diary, which she kept for many years. Myrtle always remembered everyone’s birthdays which she would call or send a card. Another one of her pastimes was cooking for her family. Myrtle made so many chocolate cakes for her sons that she would probably be very wealthy if she had a dollar for every cake made. Myrtle underwent a life changing experience by becoming healthier by joining the TOPS organization. Myrtle was very honored to be named as the TOPS queen serving as quite an accomplishment for her healthier lifestyle. Myrtle gained many friends through this organization and became lifelong friends,calling upon each other many times. It would be impossible to list all the close friends and neighbors, as she was so close to many. 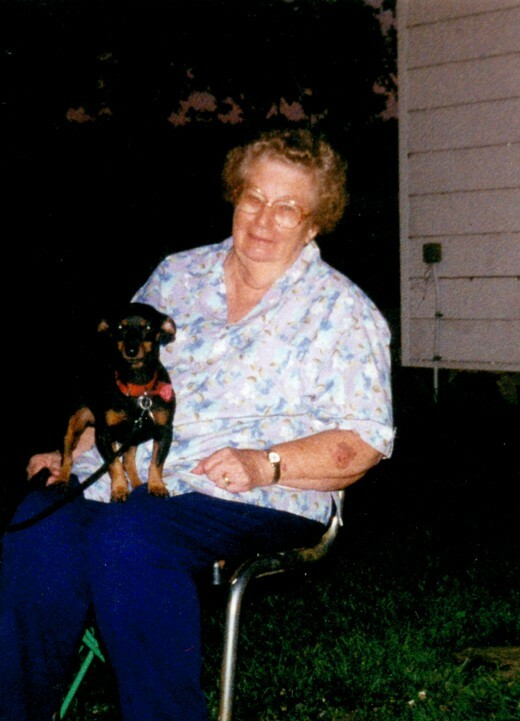 Her companion dog, Tiny, was almost like family to her as well. Myrtle loved the farm and enjoyed being around all the farm animals. Myrtle was the last living sibling of her brothers and sisters. She was preceded in death by her husband Royston Boultinghouse, a daughter in law, Darla Boultinghouse and a granddaughter Julie Hurshman. She is survived by five sons: Earl and his wife Bonnie, Charles and his wife Carol, Roy Lee, and Don and his wife Karen, all of El Dorado Springs, MO, and Alan and his wife Sherry of Girard, Kansas; thirteen grandkids: Mike, Mark, Jeffery, Jeramy, Randy, Misty, Shane, Lee, Eric, Tara, Shawn, Trent and Darcy; 23 great grandkids and four great great grandkids. Myrtle was loved and respected by all who knew her and will be greatly missed. Funeral services for Myrtle Boultinghouse were held on Friday, December 13, 2013, at 2:00 p.m. at Bland-Hackleman Chapel with Bro. Joe Sprague officiating. Murnie Fast and Anna Lee Barker provided music. Burial followed in Brasher Cemetery under the direction of Bland-Hackleman Funeral Home. Pallbearers were: Trent Boultinghouse, Randy Boultinghouse, Shawn Boultinghouse, Jeffery Boultinghouse, Jeramy Boultinghouse, Mike Boultinghouse, Mark Boultinghouse, Eric Boultinghouse, Lee Boultinghouse, and Shane Davis.